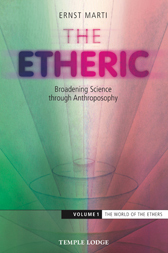 The Etheric explores the fourfold realm of the ethers. Giving an overview of their cosmic origins in the evolution of the earth, Dr Marti shows how the ethers work in phenomena of warmth, light, sound and organic life. He brings a contemporary understanding and insight to the classical elements – fire, air, water and earth – as the media through which ethericity manifests and works in the world. Four physical forces are also explored which, as opposites to the ethers, have a constant tendency to break down and annul what life-giving ether creates. Dr Marti then studies the shadow aspects of the ethers connected to what he terms the ‘sub-natural’ forces of electricity, magnetism and nuclear force. Given that the author was unable to complete this book in his lifetime, his pupil and colleague Irmgard Rossmann edited the final version in the spirit of her teacher. It is published here in two volumes, with this first focusing on ‘The World of the Ethers’ and the forthcoming volume on ‘The World of Formative Forces’.